From some days, the news has been circulated everywhere that UIDAI toll free helpline number has been auto saving in android Smartphone. Android users afraid about their personal important phone data can be spread by suspicious activities. They have worried about their phone security. User worried about how it saved in their contact list. There device may be hacked by someone or UIDAI to find out important data. Google has accepted this mistake of auto saved UIDAI toll free number in android devices. Google has acknowledged that appearing mobile number in the android Smartphone was our technical error. Initially, the question was raised against UIDAI, but UIDAI has clarified that “UIDAI has reiterated that it has not ask or advise anyone, including any telecom service providers or mobile manufacturers or Android to auto include 18003001947 or 1947 as default list of public service numbers”. UIDAI told that 1800-300-1947 mobile number is displaying in contact list which is invalid. 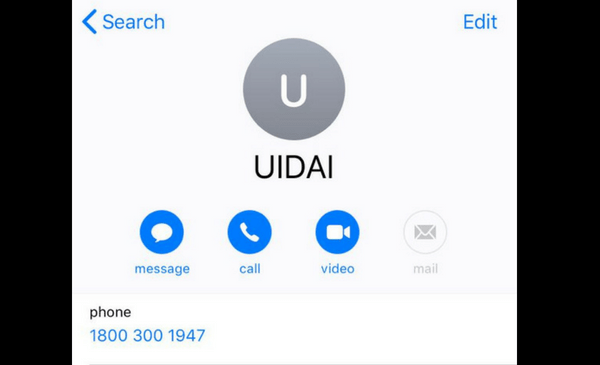 Many Android Smartphone users have complained that their phonebook has saved toll free number of UIDAI without any prior notification or informing them. That’s why users have started sharing screenshots of their device in social media. It is notable that UIDAI recently changed their toll free number from 1800-300-1947 to 1947. This means that number of android contact list found in the phone was old. Google said on Friday that they had put the number in initial setup which given to Android phone makers. That’s why this number has been transferred to many users’ mobile phones. Google has said that it will be solved within few days.